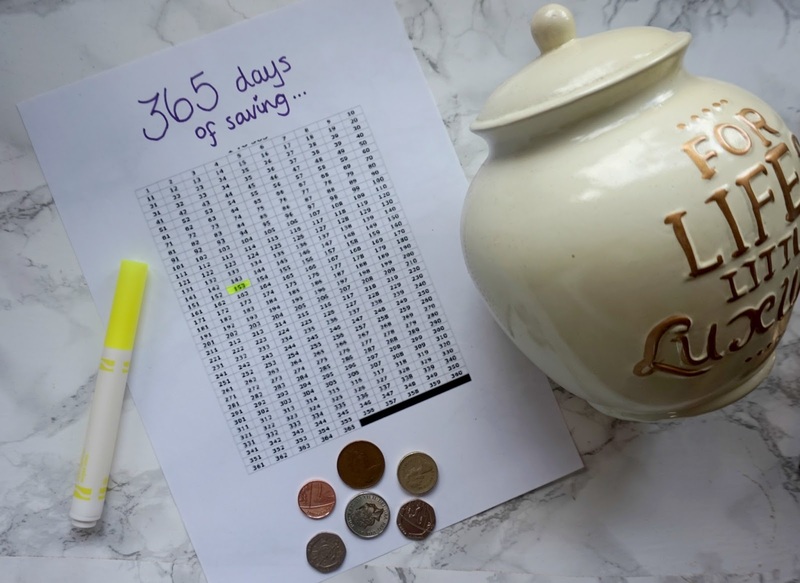 Hello lovelies, so last year I attempted the 52 weeks savings and failed, this one looks so much easier and cheaper... So you just save 1p a day and add it up to the next day so day 10 you put in 10p etc, with the most being £3.65 on the 365th day of the year adding you up to a total of £667.95. Easy right? I found this layout on Pinterest and printed it off so I could highlight it off once I put it in the money jar, I had £1.53 in change in this picture so I highlighted it of and threw it into the money box, this money box is also one of the ones you have to smash to get into so no dipping in and out of it for cheeky takeaways. I'm actually doing two of these, one for Christmas presents and the other for my trip to NewYork which will hopefully happen a couple of weeks before Christmas. Then it got me thinking how else could I save more money? The obvious, stop spending. On things I really don't need like a trip to Home Bargains every time I'm in town, I spend way too much in there on things I really don't need. Make up? I own too much as it is, why am I still buying it? I should treat myself to make up when I really need it, I'm actually going on a spending ban in February. All of those things you bought and have never used, sell it! I might get into Ebay selling this year or what other sites are good for selling things? Also gives me the chance to declutter. Cancel memberships I don't need, the gym *cough*. I never have time to go to the gym so I've canceled that and going to do some of the body coach at home or any other fitness dvd I can get my hand on, Disney Life £10 a month and I've watched 3 films on it in the whole 4 months I've had it, shocking! That's going once I've finished this post. Avoid buying books, I have a perfect library that is so close to my home but I can't resist those £3 something book offers Tesco and Asda have, so tempting. Stop having takeaways, I'm also trying to loose weight so this would help the bank and the belly. Write shopping lists down and stick to them, I wasted so much food last year, I did donate a lot too but it's sad how much we waste, now I'm going to be eating healthier I'm going to plan meals out and only shop for those things I need, shop as frugal as I can. Shop around, if there is something I am really after it doesn't have to be the most expensive, I'm quite savvy in this department anyway I love a bargain. Do more DIY, I did a lot of handmade things for Christmas this year, it didn't break the bank and everyone was over the moon with their gifts, it made it even better! Book in advance for anything! You will always get cheaper deals this way. Get your birthday and christmas presents in the sales when there on. Make lunches to go, I spend so much on food when I'm out and about, I need to start making lunches. Stop going to Costa/Starbucks, £4 a pop that's a hefty bill. Ask yourself if you REALLY need that object, each month I'm noticing a massive difference in this to be honest, I've shocked myself. I've hardly bought any make up this year, when I have bought myself things they have been in the sale, I got so many great bargains in NewLife home the other week books that should cost around £12-£20 for just £1-£3. What other ways can you think of to help you save money? Great tips. I've found planning my meals has helped me save so much money and I throw away less food now. I've just started saving every £5 note I get, since they've brought in the new notes they don't feel real to me yet so it's easy to not spend it.